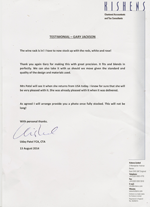 I would like to thank and recommend Gary Jackson of BWS. I think the name of his business totally sums up him and his work - it is totally bespoke. I initially spoke to Gary earlier in the year about a large unit taking up a whole wall in my house as I have a whole lot of vinyl records in boxes in the loft and I wanted to start playing them again so needed somewhere to store them. Initially we spent a couple of hours one evening talking about what I wanted and Gary then went away and came back with a design which I was happy with so we agreed a start date. Once Gary started the work I realised how bespoke it actually was all built from scratch to fit the space and once built painted and the finished job was truly amazing and has transformed the room. I now have all of my LP's within easy reach and now just have a buy a new stereo system for the space allocated for it. 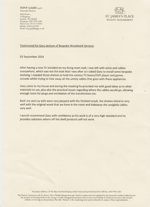 The work was carried out in a professional manner and all areas and walls cleaned spotless before they left and all of Gary's work was done to the highest standard I have seen before. After having a new TV installed on my living room wall, I was left with wires and cables everywhere, which was not the look that I was after so I asked Gary to install some bespoke shelving. I needed these shelves to hold the various TV boxes/dvd player and games console whilst trying to hide away all the untidy cables that goes with these appliances. Gary came to my house and during the meeting he provided me with good ideas as to what materials to use, plus the practical issues regarding where the cables would go, allowing enough room for plugs and ventilation of the transformers etc. 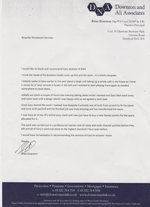 I would recommend Gary with confidence as his work is of a very high standard and he provides solutions where off the shelf products will not work. We recently employed Gary Jackson of Bespoke Woodwork Services to lay a wooden floor throughout our hallway and dining room. 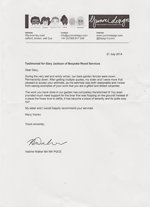 We are extremely happy with the work Gary carried out. He was punctual arriving in the morning and meticulous with the smallest details of his work. 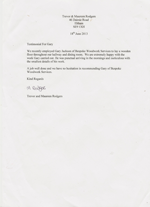 A job well done and we have no hesitation in recommending Gary of Bespoke Woodwork Services. Thank you Gary for making this with great precision. It fits and blends in perfectly. 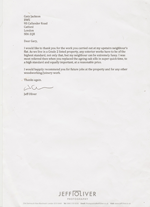 We can also take it with us should we move given the standard and quality of the design and materials used. Mrs Patel will see it when she returns from the USA today. I know for sure that she will be very pleased with it. She was already pleased with it when it was delivered.